Visitors to your meeting will be impressed by our 120-acre site and free WiFi. 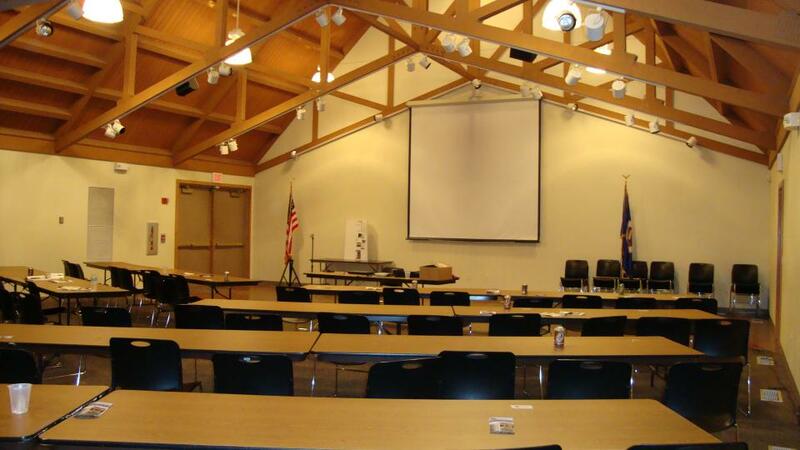 Rent the whole facility or just one meeting room. Board Room: Accommodates 20 people seated boardroom style or 35 people theater style. Exhibition Gallery (pictured here): Accomodates120 people seated around tables or 150 theater style. This vaulted ceiling room includes a sound system and large wall-mounted screen. Multi-Purpose Room: Accommodates 120 people seated around tables or 150 theater style. This room includes a sound system, vaulted ceilings, large south windows and access to the catering kitchen. The Exhibition Gallery and Multi-Purpose Room can be joined to make one large meeting space (seats 250). Exhibition Square: Take advantage of the beautiful summer weather and rent the Exhibition Square, which is a grassy area located directly behind the Visitor Center. Great space for outdoor wedding ceremonies. Use of the catering kitchen, the patio area with picnic tables behind the Visitor Center, a podium, handheld microphone (with cord), lapel microphone (cordless), registration table, tables and chairs for indoor use only. We have 8 cocktail tables, 27 round tables and 27 banquet tables (each table seating 8) and 250 chairs. The facilities are available to rent from 8am – 3pm each weekday. After 3pm, and on weekends, there will be an additional charge for staffing. Rooms may be rented until midnight. Call or email for pricing 507-835-2052, info@farmamerica.org. $10/ person for a minimum of 10 people. Your staff will be shuttled around the historic site on a tractor-drawn tram and given a private tour by one of our experienced interpreters.